UPDATED: Thu., Aug. 2, 2018, 6:46 p.m.
SEATTLE – The Washington Huskies open fall camp this afternoon with plenty of reasons for optimism. Among them, the Huskies were picked sixth in the preseason coaches’ poll on Thursday. 1. Are the receivers capable enough? UW’s wide receivers know they have been labeled by some as the “weak link” on this roster, and they know they need to emerge after an inconsistent 2017 season from the passing game. Chico McClatcher’s return from injury will be a major factor, and the likes of Aaron Fuller, Andre Baccellia and Ty Jones got a taste Pac-12 play last season. There is uncertainty, sure, but also enough talent here to think this group could surprise some this fall. 2. Who’ll play tight end? There’s no other way to put it: The loss of Hunter Bryant to a potentially season-ending knee injury is a huge blow to the UW offense. 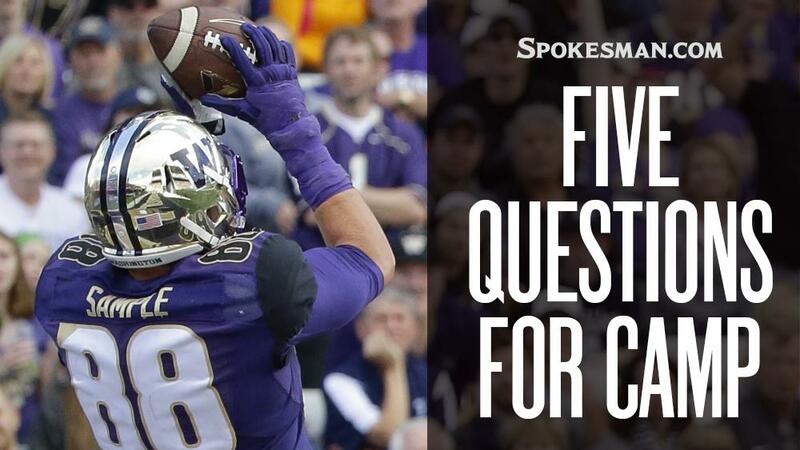 Bryant was going to be counted on as one of Jake Browning’s top targets this season, but the good news for the Huskies is they do have strong depth and promising young talent at tight end. That starts with senior Drew Sample, who might be the ideal sixth offensive lineman in the Huskies’ multiple-tight-end formations. Sample has experience and he, at the very least, is a capable contributor in the passing game, and could be one of the team’s top breakout candidates in 2018. Throw in Jacob Kizer, Cade Otton, DeShon Williams and incoming freshman Devin Culp. 3. How quickly can the freshmen class produce? This speaks more to the general momentum of the program, but the Huskies are again building one of the Pac-12’s top-rated recruiting classes, with 13 known commitments for 2019. This comes on the heels of a 2018 class that finished as the highest-ranked class Chris Petersen has signed, and several of those recruits – wide receiver Marquis Spiker, defensive tackle Tuli Letuligasenoa, safety Julius Irvin, among others – could have an immediate impact this fall. 5. Can Myles Gaskin keep it up? The Huskies have had running backs who were faster (Napoleon Kaufman comes to mind), backs who were bigger (Greg Lewis), backs who were flashier (Corey Dillon) and backs who had greater prestige (Hugh McElhenny), but never have the Huskies had a back who has been as productive, as durable, as dependable as long as Gaskin has been. It can be difficult to pinpoint exactly what makes Gaskin great – it’s a lot of little things that add up to one complete package – but this much is clear: The Huskies won’t be great in 2018 without a great senior season from Gaskin. Published: Aug. 2, 2018, 6:24 p.m. Updated: Aug. 2, 2018, 6:46 p.m.